Effective July 1, 2019, all real estate closings in the State of New York will be affected by the recent increases in the transfer and mansion taxes but the new law will not apply to conveyances made pursuant to binding contracts entered into on or before April 1, 2019 even if the transaction closes after July 1, 2019. The purchaser and/or seller will have to prove the date of execution by independent evidence such as a recorded contract, payment of a deposit on contract or other facts and circumstances determined by the NYS Commissioner of Taxation and Finance. Clearly, when you are discussing the costs to be incurred by a seller or a purchaser ready to enter into a contract of sale, it is imperative that you provide your client/customer with accurate information and knowing the particulars of the new tax laws imposed by New York State is of the utmost importance. As an attorney practicing transactional real estate, I am responsible to inform my clients of all anticipated closing costs associated with their purchase or sale and in my humble opinion, it is your responsibility to do the same. Obviously, the seller should understand the costs to be incurred in order to determine whether a submitted offer is financially viable and likewise, a purchaser should be advised of anticipated closing costs to determine if there are sufficient assets on hand to support the offer. I want to thank my colleagues at Regal Title Agency for providing me with the particulars of the new tax laws so that I can equip my readers with the information necessary to better serve their clients and/or customers. B. On all other conveyances (i.e. not Residential Real Property) when the consideration is $2,000,000.00 or more. 3. The Mansion Tax (normally payable by the buyer), is presently one percent on conveyances of Residential Real Property (as defined above) when the consideration is $1,000,000.00 or more on one to three family dwellings, cooperative and condominium units. 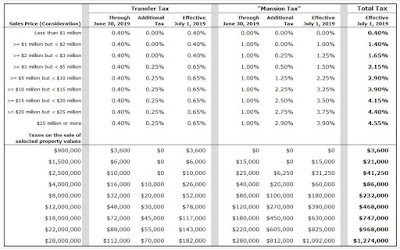 There is now a supplemental Mansion Tax (only applicable for cities of One million residents or more ) that increases as the consideration for the conveyance increases. 4. 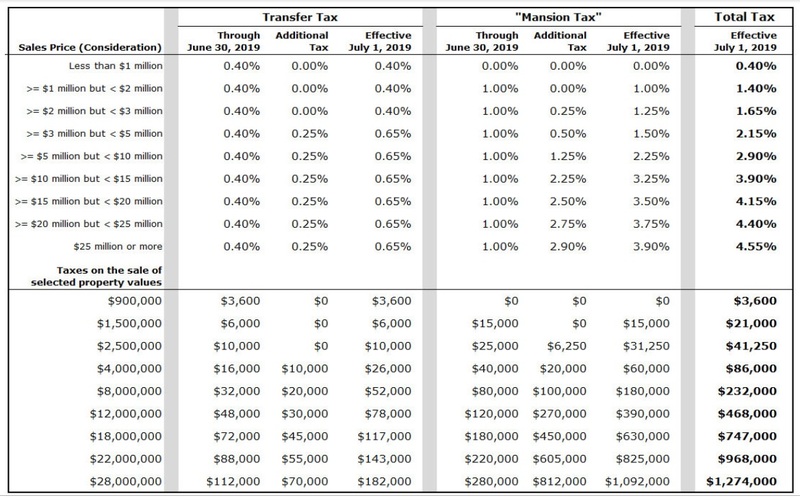 The New Transfer and Mansion tax rates take effect on July 1, 2019, for conveyances occurring on or after July 1, 2019. If you close after the effective date but can prove you entered into a binding contract as confirmed by independent evidence such as the recording of the contract, payment of the contract deposit or other facts and circumstances, determined by the Commissioner of Taxation and Finance, the parties will be permitted to pay the current rates. If you enter into a contract today, but close, record and pay the transfer tax by June 30, 2019, you will be charged the current rate, not the increased rate. Hopefully this will serve as motivation for all agents to familiarize themselves with closing costs associated with real estate transactions and to educate their clients/customers of these costs in advance of taking a listing on behalf of a seller or presenting an offer on behalf of a purchaser, so direct yourself accordingly. CALL / EMAIL ME! I'M HERE FOR ALL YOUR REAL ESTATE NEEDS! Working by referral. Let me help you find a home too! !